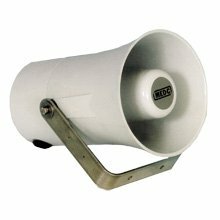 This range of loudspeakers has a power rating of 15 Watts and is suitable for use in demanding environments where a robust construction and high ingress protection rating is required. Cooper MEDC can also provide a range of speakers suitable for use in potentially explosive atmospheres. For more information, refer to the datasheet or contact Cooper MEDC. Power tappings, via integral transformer. 316 Stainless steel ratcheted mounting bracket. BS5839 part 8 compliant version available.